Solving tole and decorative painting problems and challenges. Cheryl, what are your recommendations for removing fabric paint from an ooooppss spot on a gorgeous jacket that I painted. 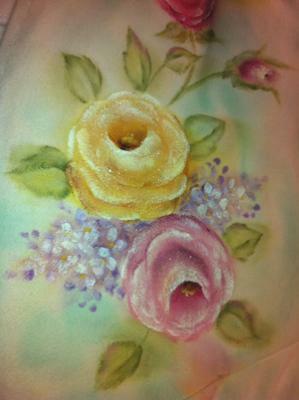 It is a white cotton blend jacket that I painted these GORGEOUS roses and florals on. And then... I got the lower end of the front on the jacket into my palette! I tried EVERYTHING and could not get it out. Broke my heart- it really turned out beautifully and I ruined it. It would be good to know for the next time. The beautiful design is by Kathy Whiton, CDA. I have an aluminum boat paddle with cut out wording to be used as a wall decoration, how can I paint it? What kind of primer and paint do I need? I have a new raw wooded box that I am going to stain. I want to hand paint decorative pinstriping and lettering over top. What is the correct process? Can I stain the whole box first and then paint the decorative acrylic over top? I do plan on first painting a prime coat of gesso before the decorative acrylic. I will finish with a clear protective finish coat over the complete box. I want to paint a terra cotta pot with a different color band on the top. What is the best way to get a nice clean line? I tried masking tape under the line but with the curve under the band of body of the pot, it is difficult. Any suggestions? Hi I want to repaint an old milk can and don't know how to start. It only has a base coat on it.